Weather Bunny is flying the official Chicago city flag! 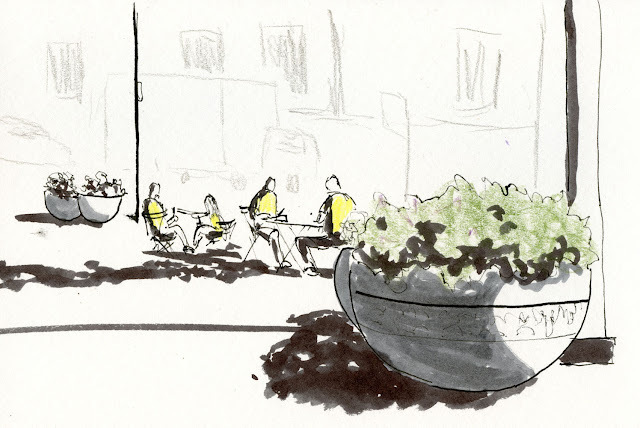 I’m on my way to the 8th International Urban Sketchers Symposium in Chicago! Compared to the prep for every other USk symposium I’ve attended (Manchester, Paraty and Barcelona), this one was a piece of cake. Planning for domestic travel is always less work than for international. In addition, I’m neither taking workshops nor serving as correspondent this year, so I have much less materials to bring (or worry about whether I should bring). What’s more, it was only a couple of months ago that I was in Italy, so my sketch kit is already in pretty good shape. I don’t have a strong sense of Chicago’s urban palette, so I left my colored pencil palette unchanged. I’ve been using a Gekkoso pencil a lot lately, so I kept that in. Heeding my own advice in my post-travel follow-up from Italy, I took out the Sailor Cross Point pen and put back my second Sailor fude. 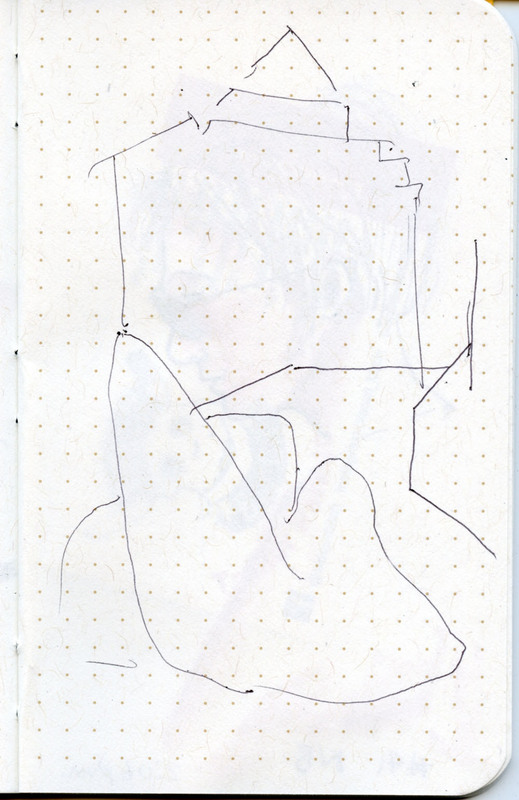 I stitched up my usual Canson XL 140-pound paper into several sketchbook signatures. In other words, everything is the same as my daily-carry here at home. And although it’s not part of my daily-carry, I learned in Italy that my landscape-format softcover Stillman & Birn Beta sketchbook is now an essential – not optional – part of my travel kit. 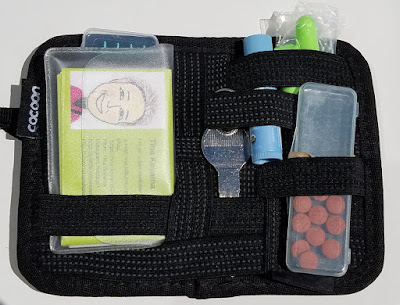 So – almost everything is identical to what I took to Italy and that I’ve been using ever since; no new sketch materials to show here (sorry to disappoint!). All sketch materials now live in these three organizers: the Tran Portfolio for my colored pencils and two Lihit Lab Slim Pen Cases. What is new is one of the organizers in my usual Rickshaw bag (see above). 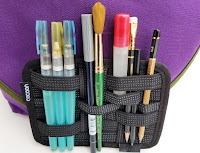 You may recall that about a month ago I replaced my previously beloved Kutsuwa Dr. Ion bag organizer with a combination of a Grid-it and a Lihit Lab Slim Pen Case. After a few weeks of use, I decided that while the Grid-it’s elastic bands are very handy in concept, they are also so tight that I was constantly fighting with them when removing or replacing implements. 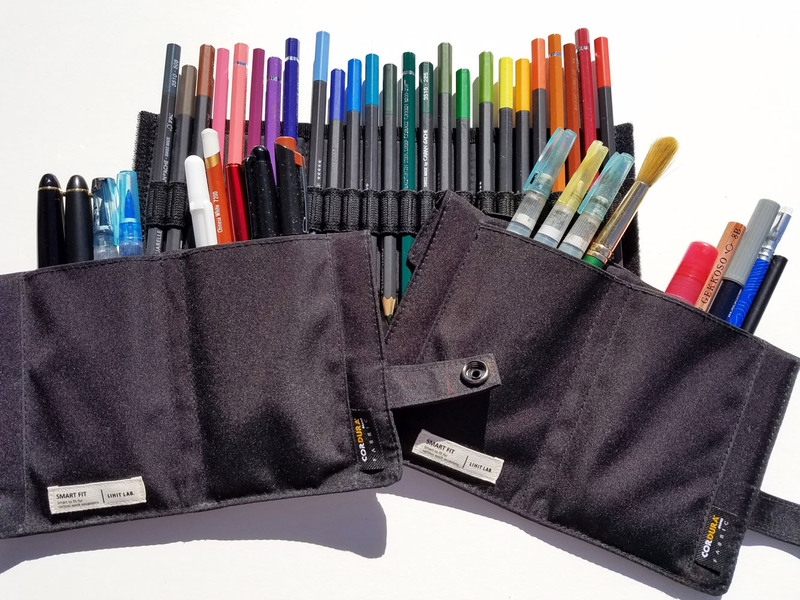 I recently replaced the Grid-it with a second Lihit Lab Slim Pen Case, whose two streamlined pockets are just enough to hold all the implements that were in the Grid-it in a single row with no room to spare (which prevents me from shoving in more). 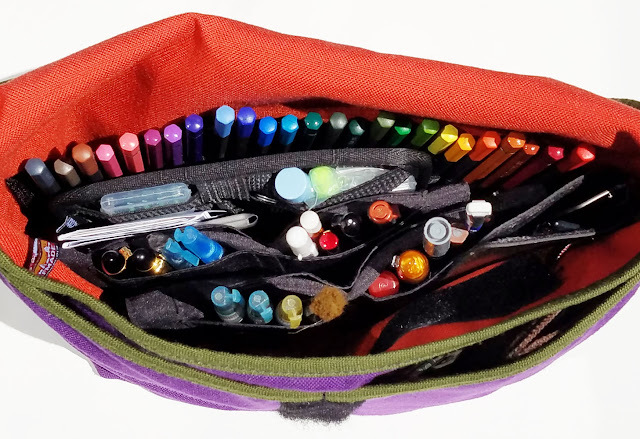 Together with the Tran Portfolio Pencil Case housing my colored pencils, everything is fully upright and accessible. Since the Lihit Lab cases are separate units, I can keep them from bunching up into one bulky lump. A major improvement in these three units over the Dr. Ion is that I cannot add a single item without taking something else out! For those of us who lack discipline, it’s a continually self-enforced, self-limiting system! I knew I could trick myself into efficiency somehow! The extra-small Grid-it now holds my usual "purse" stuff. After the symposium, we’ll be making a short visit to Minneapolis. Stay tuned for the full report on my Midwestern travels when I return, or keep up with me on Instagram and Flickr! One thing I studied in my colored pencil class last winter that is especially applicable to sketching on location is rendering the forms of trees. Every drawing exercise took many hours of work at my desk, but I think all that work helped me to finally observe landscape forms in a way that I never had before. 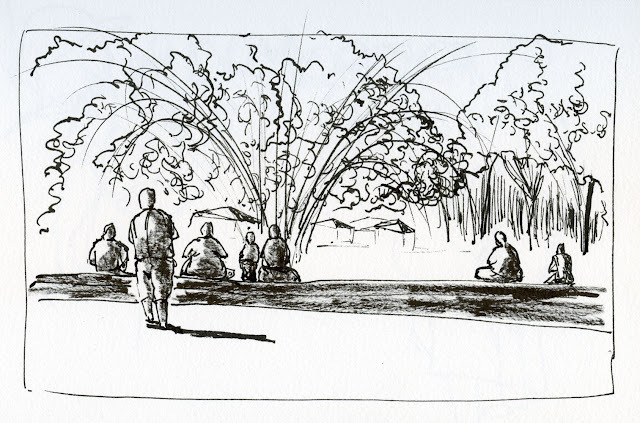 Although all our practice was done from photographs, some of scenes I probably would never choose to sketch on location (or ever), like nothing but a sky full of clouds, our exercises with trees were very helpful to urban sketching. I’ve been practicing my (hopefully) improved observational skills of trees with graphite, and last week I did a few studies in color. From our tiny upper-level deck, my view of our neighbor’s tree is unobstructed, but I can’t move around to get different perspectives, so I thought it would be interesting to change it up by varying the time of day that I sketched it. (We’d been having an unbelievable streak of sunshine and clear skies every day for weeks, so I didn’t even have to deal with clouds changing the light quality.) 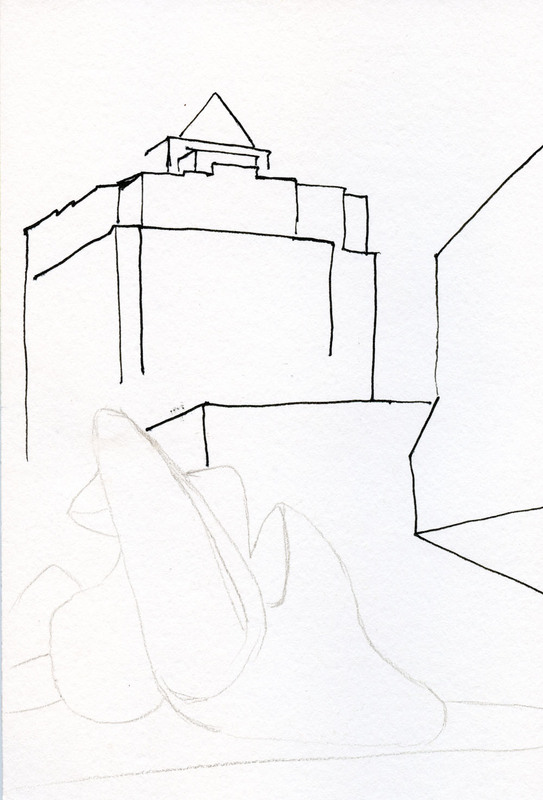 On two days, the top sketch was done around noon, the second at 9 a.m., and the last one around 4 p.m. I used some of the same pencils on all three sketches, and I varied at least a couple pencils in each one to experiment with mixes, especially in the shading. My favorite is the first one I did, at high noon (at top of page). Maybe it was just freshest because I hadn’t attempted it before, but I also like the mix of colors I used ranging from yellow-green to violet. In addition, although the sun was high up overhead, it was also coming from the south, so the tree was nicely lit from one side. See those dark blobs and streaks on either side of the tree’s trunk? 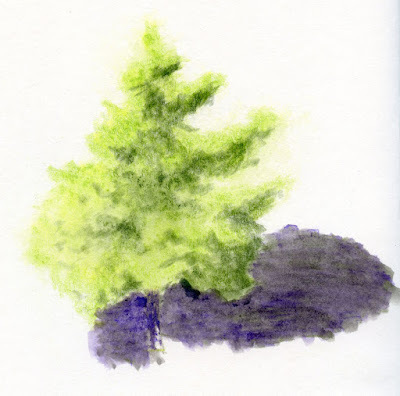 I had sprayed the foliage with water to bring out the pigment, and I thought it was all dry (OK, I wasn’t sure, but I decided it was dry enough). 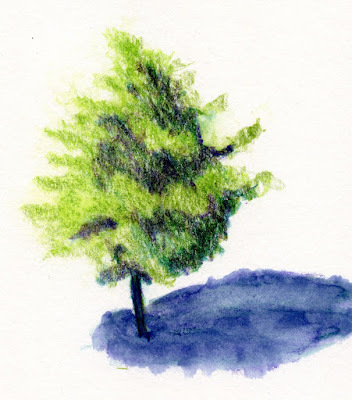 I started to apply dry pencil under the tree for the large shadow, and that’s when I hit the spots where the paper was still wet. 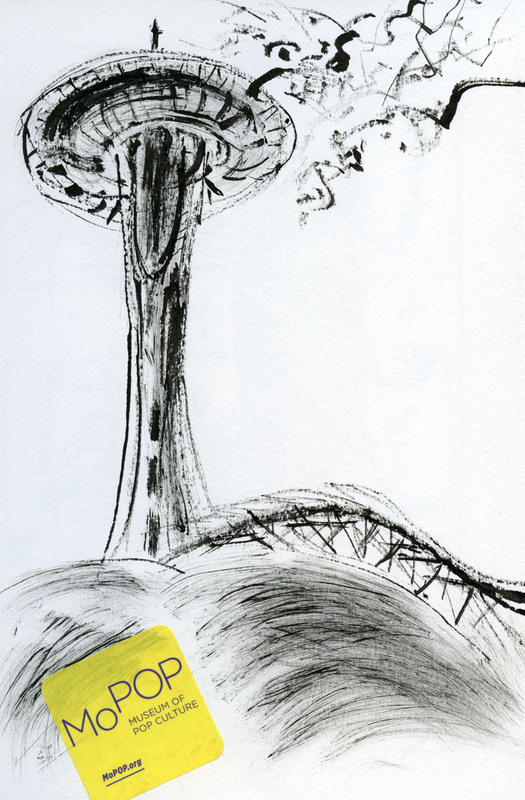 The pencil made huge, intense blobs of pigment in the wet spots. I tried to fix them by dabbing with a tissue, but that picked up more pigment than I wanted. So I went back in with more pencil, but my previous dabbing had roughed up the paper, so the pigment applied unevenly. I went through a couple more rounds of this before I realized I was only making it worse, so I finally stopped. (I could hear Suzanne’s voice admonishing us over and over, “Patience! Wait for the water to dry completely!”) I wouldn’t have even needed much patience because I was standing in the blazing sun, and the paper dried in a few minutes! Lesson learned. Several hours later that same day, I tried again, and this time the tree was fully backlit (at right). 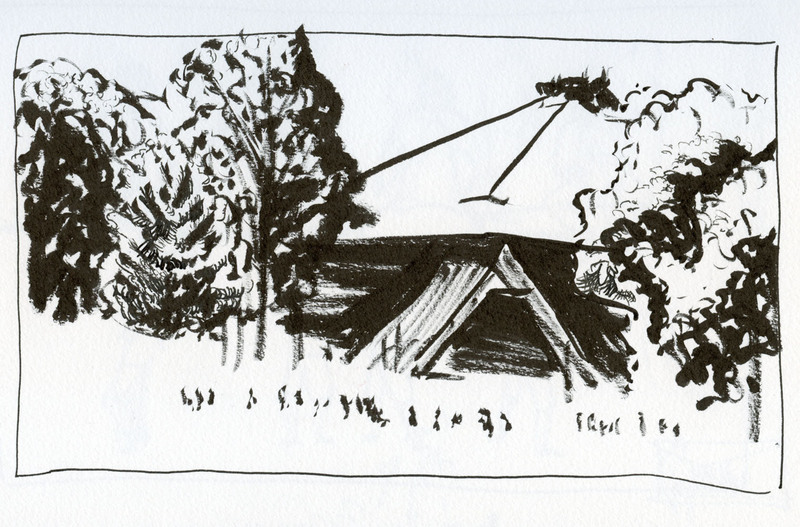 Typically, I wouldn’t choose to sketch a subject that is backlit if I can simply walk around it to the lighted side, but since I’d decided to sketch only from our deck, it became an interesting challenge. I used a different combination of dark green, blue and violet for the shading, and I like the glow of yellow around its edges. I sprayed the foliage, then went inside for a half-hour so I wouldn’t be tempted to keep going before the paper was completely dry. 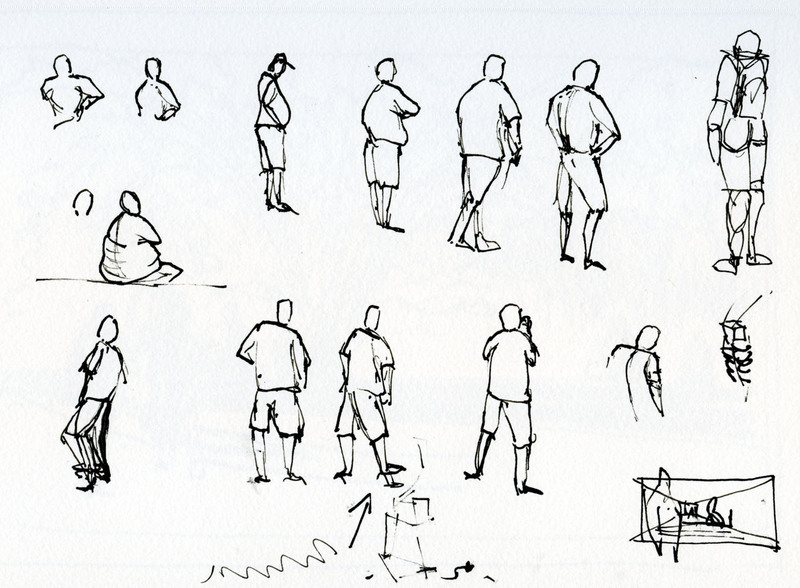 I like the 4 p.m. sketch too, if only because it shows that I can learn. 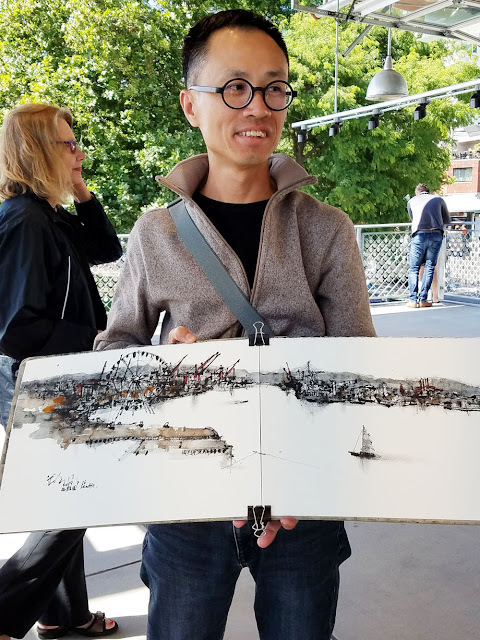 As much as I think of myself as an “urban” sketcher, I admit that I’m not often inspired by the modern glass and steel skyscrapers that fill so much of Seattle and many other cities. But on Tuesday I’ll be on my way to Chicago for the 8th International Urban Sketchers Symposium, so I decided I’d better get some practice. 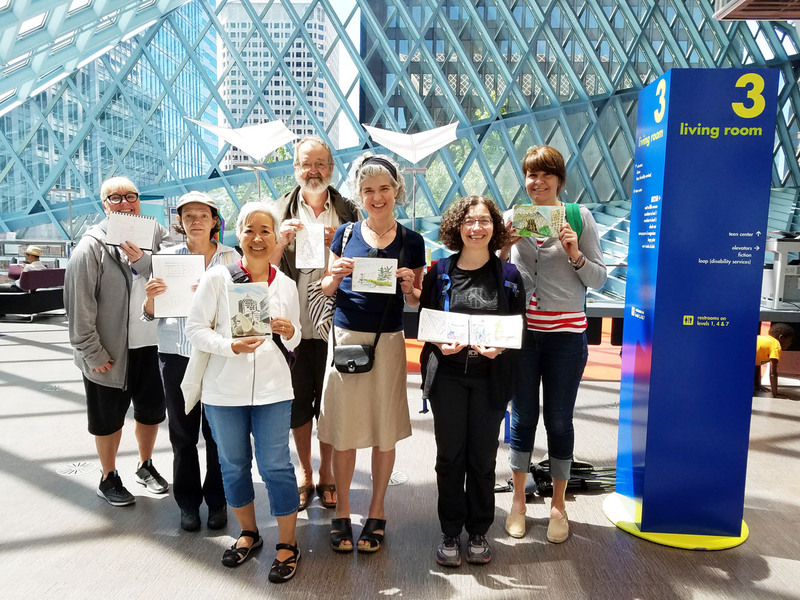 When USk Seattle gathered yesterday around the downtown central library, it was a good opportunity to see if I had any dormant modern architecture mojo. Across the street from the library in front of Safeco Plaza stands (reclines?) an organic bronze sculpture by Henry Moore. Called Vertebrae, it’s composed of three pieces, and the Seattle version (there are others) sits in a shallow pool of water. 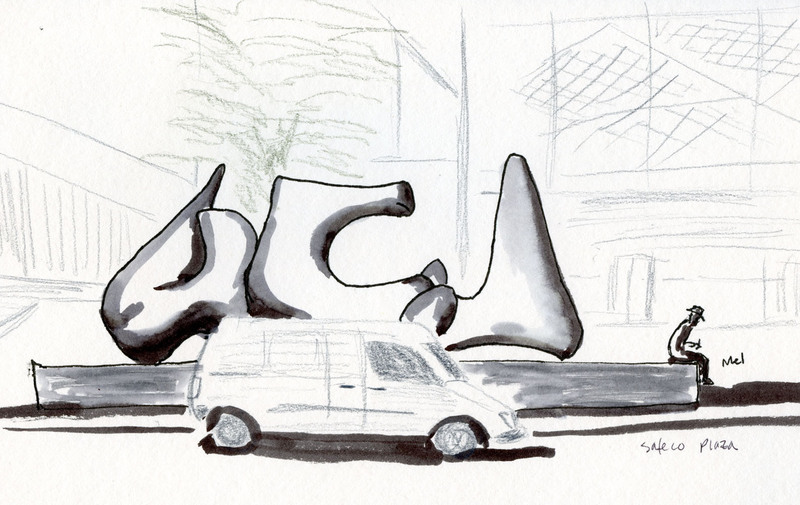 Crouching near the ground to find a way to get both the sculpture and a not-too-tall building in the same composition, I found an interesting contrast between Vertebrae’s organic curves and the W Hotel topped by a glass pyramid. I even managed to squeeze in a bit of the central library’s multi-faceted side. 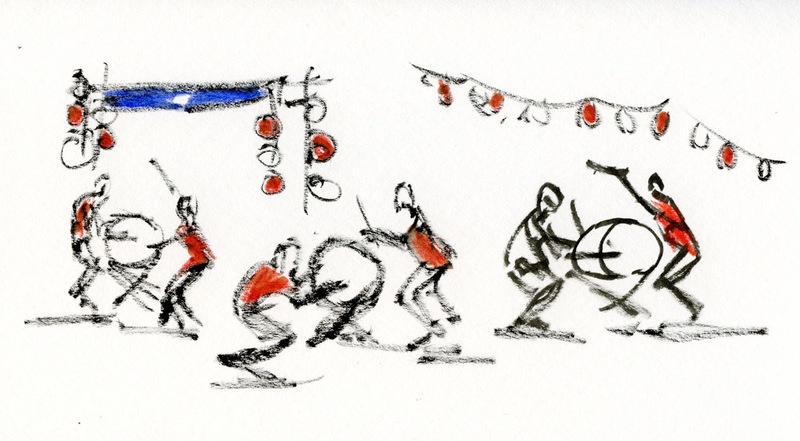 With only a half-hour left before the throwdown, I had to choose a simpler composition next. I walked back across the street and sketched Vertebrae again, this time showing all three parts (plus Mel sketching on the edge of it). For a sunny Saturday, our USk turnout was relatively small, but we had some competition: It’s apparently one of the biggest weekends of the summer for neighborhood parades, Seafair events, Bite of Seattle, music festivals and other attractions, not to mention the usual sports. No wonder downtown Seattle streets seemed so empty – everyone was somewhere else. 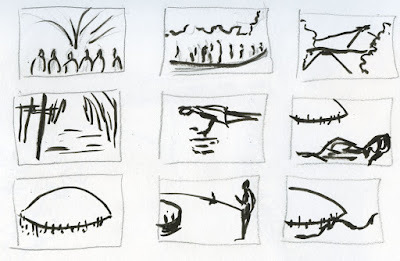 Process note: The first sketch was enough outside my comfort zone that I decided it was a good time to heed Melanie Reim’s (and many other instructors’) advice to make a thumbnail first (see below left, done in a Field Notes notebook). That gave me confidence to proceed in my usual sketchbook. 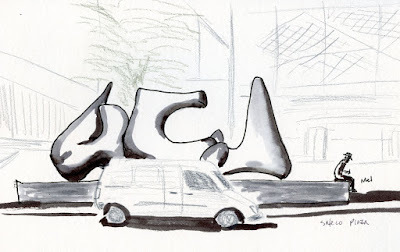 Despite using the thumbnail as my guide, I must have marked off my measurement points wrong, because the W Hotel behind the sculpture got way out of proportion (below right). Fortunately, I realized it after wasting only about 10 minutes, so I abandoned it and started over. 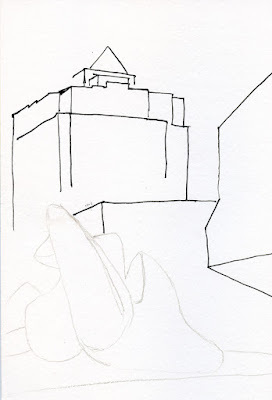 This time my finished sketch followed the thumbnail closely (and captured the building’s proportions relatively accurately). First attempt -- abandoned early, thank goodness. Whew. Even with the best of intentions and planning, things can go awry so easily. But going awry is not a problem – as long as I notice soon enough and have the good sense to start over. I’m not sure my modern architecture mojo is awake yet, but at least I gave it a nudge. 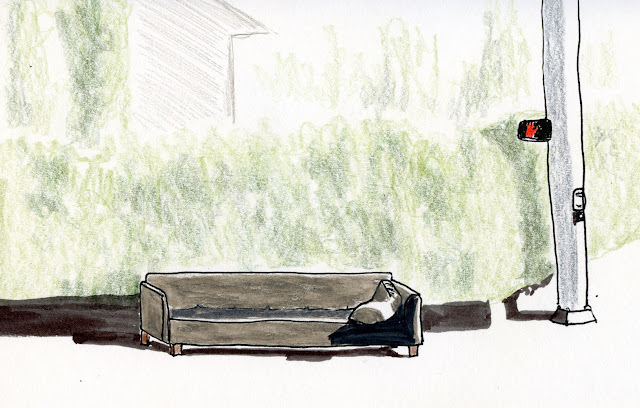 This couch at the corner of North 85th and Wallingford took me twice as long as usual to sketch. It’s a very busy intersection, and every time the light turned red, two lanes of traffic would completely block my view across the street. I had to keep waiting for the light to change, and when it did, I could see the couch only during the brief spaces between cars going by. Then the light would turn again. It was missing two cushions as well as a price tag; perhaps it was even cheaper than free. Getting ready for bed, Greg was closing the blinds when he saw it. Parked in front of our neighbors’ house was, indeed, a Batmobile. (They don’t own a car.) It had appeared mysteriously in the night. I suspected that it would be gone by morning. Luckily for me, it was still there in the daylight: a ‘60s vintage Lincoln Continental. 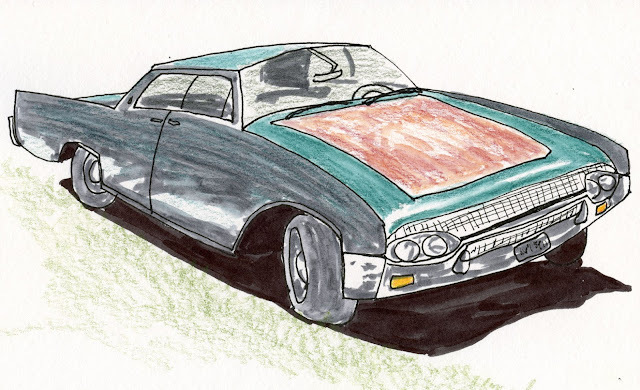 Its once dark-green finish was so old that it was now matte instead of shiny, and the hood had a center panel that might have been a different color at one point but was now mostly rust. The rear-view mirror was a creative DIY repair job. The plates were current, and peeking into the windows, I saw no signs of long-term residence. I’m guessing it will disappear into the night sometime soon as mysteriously as it had appeared. 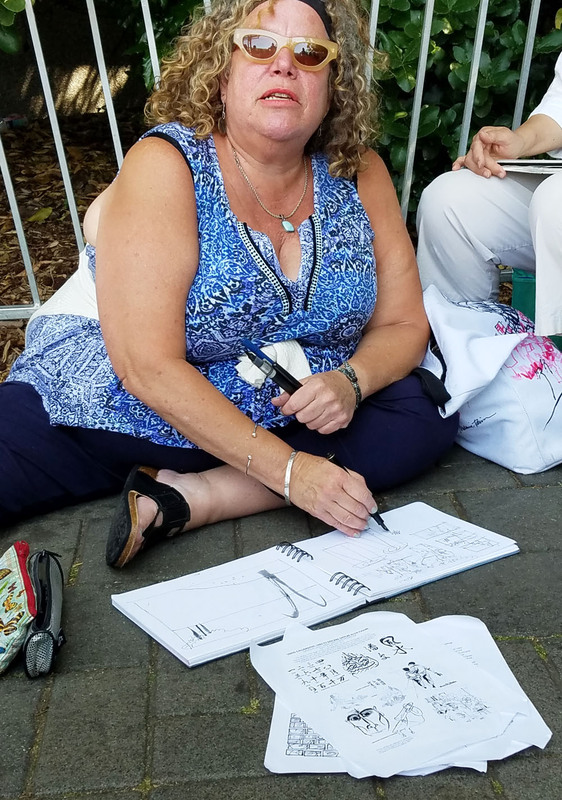 7/14/17 Melanie giving a presentation on her reportage work. 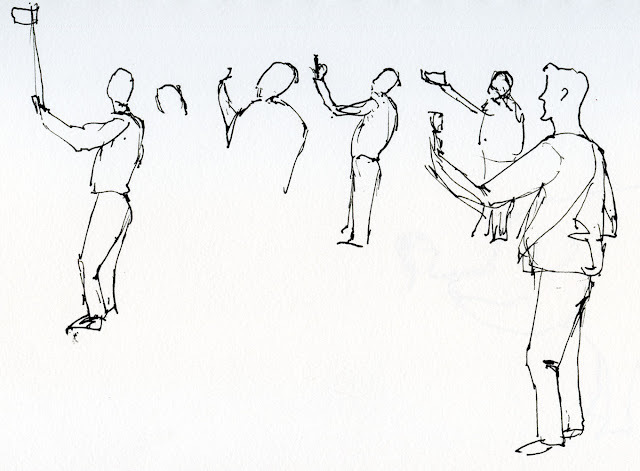 Melanie Reim’s portion of the Dancing Lines workshop focused on sketching people in the urban landscape – individually and in large crowds. 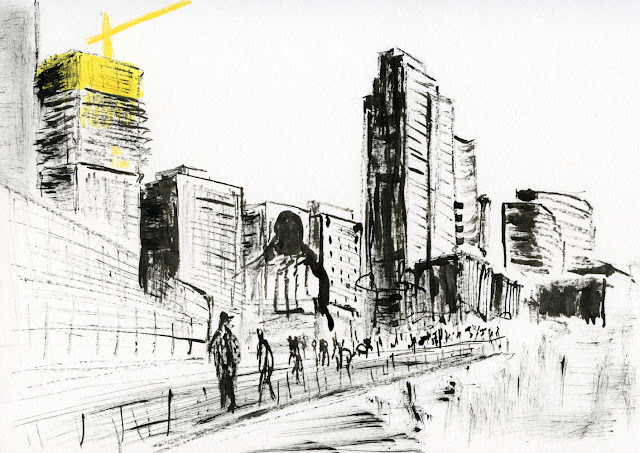 With many years of teaching experience at New York City’s Fashion Institute of Technology, Melanie shared not only her personal experience with urban and reportage sketching but also her vast knowledge of drawing the human figure. All her storytelling through drawing is based strongly on composition (what she calls design) – enabling the story to be told through the emphasis you place on one element or another in the design of the picture. For example, the same scene can be sketched with an emphasis on the background or on a group of people or one person, depending on the composition, and each sketch will tell a different story. 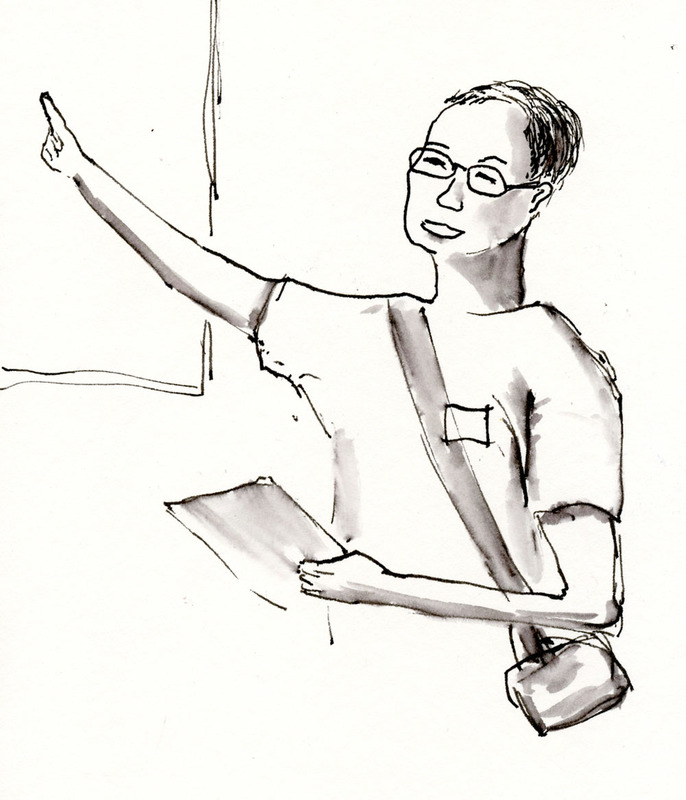 During my group’s afternoon session on the first workshop day, Melanie walked us through the handouts she had sent in advance on creating thumbnails, the basics of human torso anatomy, tips on drawing a crowd of people, and looking at calligraphic strokes from different written languages as inspiration for describing figure gestures. She also talked briefly about some of her favorite drawing tools. 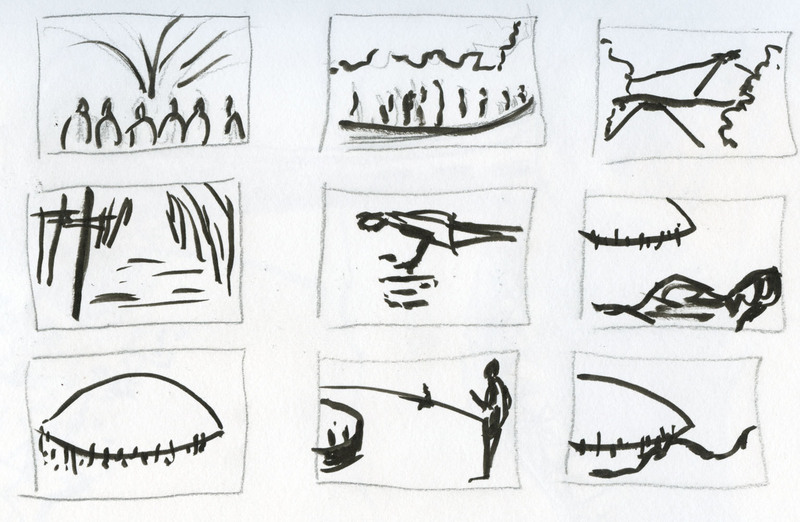 tell the story of a sketch. 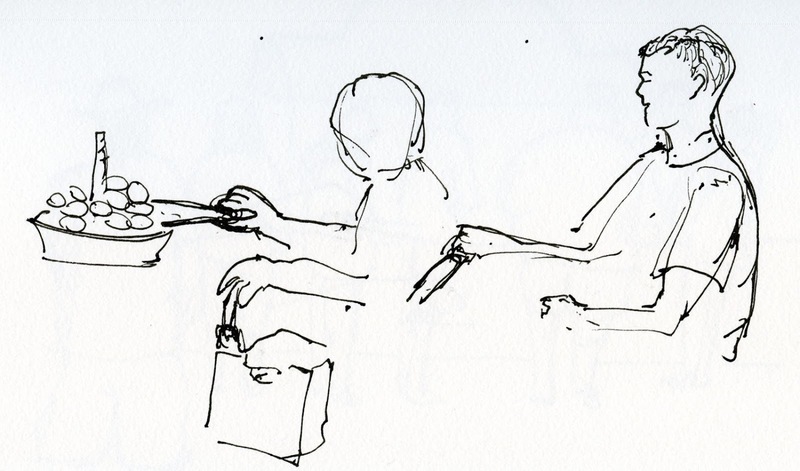 Melanie giving feedback on our sketches. In my series of small studies, see the arrow in the bottom row (above)? That’s where Melanie made a small correction to my figure. She said the guy’s shoulder angle and the way his hips were turned indicated that his right leg should be slightly closer to me, and therefore the right foot should appear slightly lower than the left. 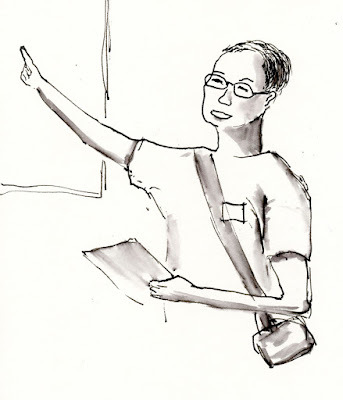 I was astounded that such a small correction made a big difference in making the gesture look “right.” I’ve learned these very principles in life drawing classes, and I try to practice them whenever I go to life drawing sessions, yet I was still astounded to see how small differences matter greatly. The last exercise of the day was to combine figures with a background (above). 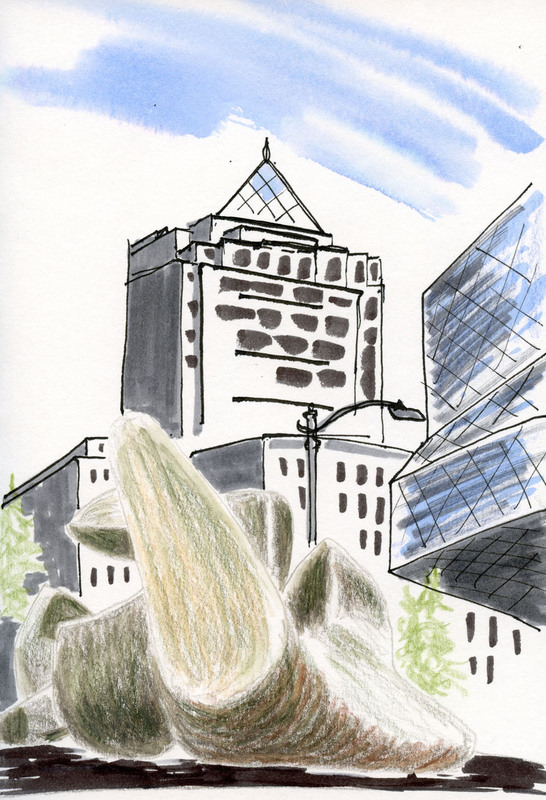 Most participants chose the fountain as a central focal point. I inadvertently developed a way to shade the figures that looks very similar to the scumbling we had done with a stencil brush in KK’s session. I had been using my favorite Sailor brush pen filled with Platinum Carbon Black so much in the earlier exercises that it started to run dry. I like the charcoal-like look so much that I’m going to start carrying a brush pen that’s running dry just for this kind of shading. in the relative quiet of the Market's Atrium. Melanie started out with my group the next morning at the Pike Place Market. 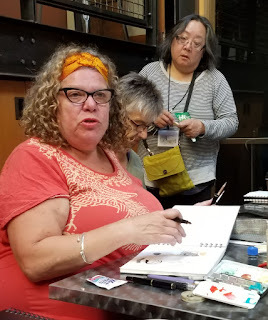 At a quiet table in the Atrium, we had an opportunity to hear her talk more about her favorite materials – brush pens, fountain pens, dip pens with long, flexible nibs – as she showed us how she uses them to make expressive, variable lines, which are her trademark. That quiet didn’t last long, however. 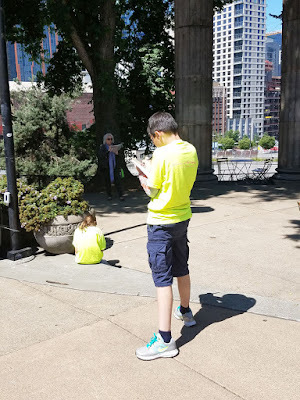 It was a sunny summer Sunday at the Market, and we headed straight out into the thick of what was probably the single densest concentration of people in Seattle at that hour. 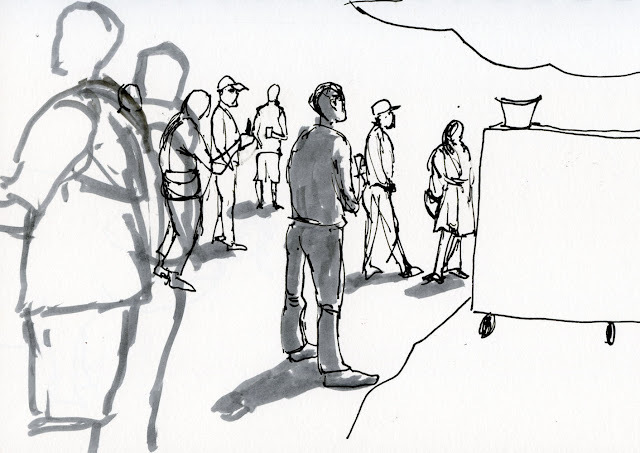 A NYC native, Melanie thrives on sketching crowds! Our assignments were to draw some individuals and crowds, again focusing on body language, and to look at one individual making repetitive movements (such as all the market vendors serving customers) and draw a series of sketches indicating those movements. For crowds, she suggested seeing them as a single large shape rather than a collection of individuals. These were all very challenging, of course, since the crowds are moving constantly, and I was also in the middle of such crowds. 7/16/17 People photographing the fish mongers tossing fish. 7/16/17 Waiting in line for donuts. 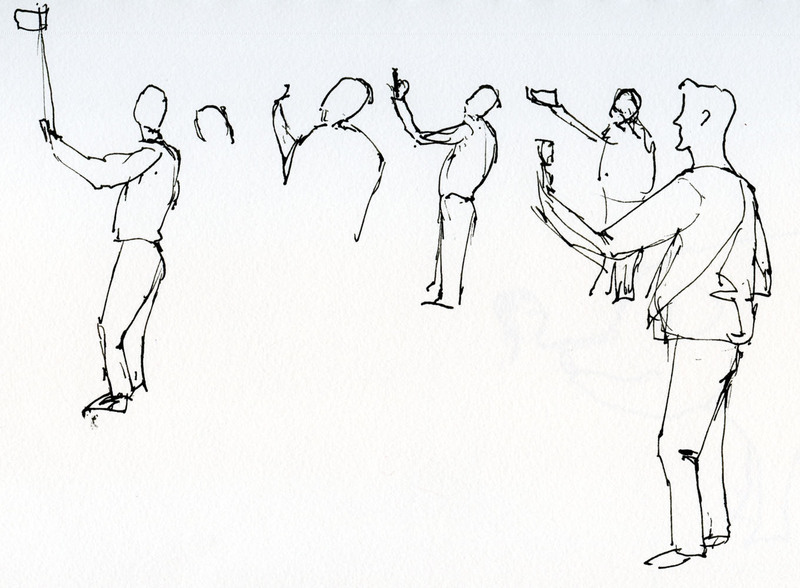 My favorite from these exercises was my sketch of various audience members watching a piano busker perform. (You can imagine how difficult it was for me to resist sketching the busker himself!) As Melanie suggested, I tried to capture a sense of depth and draw individuals and their body language, not generic people. 7/16/17 The piano player's audience. 7/16/17 Sequence of movements made by the donut vendor. Melanie’s extremely informative portion of the workshop covered much ground in only six hours. I’ve tried to summarize as many of her main points here as I could remember, but I know that to really reinforce and retain the information, I need to use what I learned immediately and keep practicing whenever I can. Again, many thanks to USk Seattle for bringing KK and Melanie here. 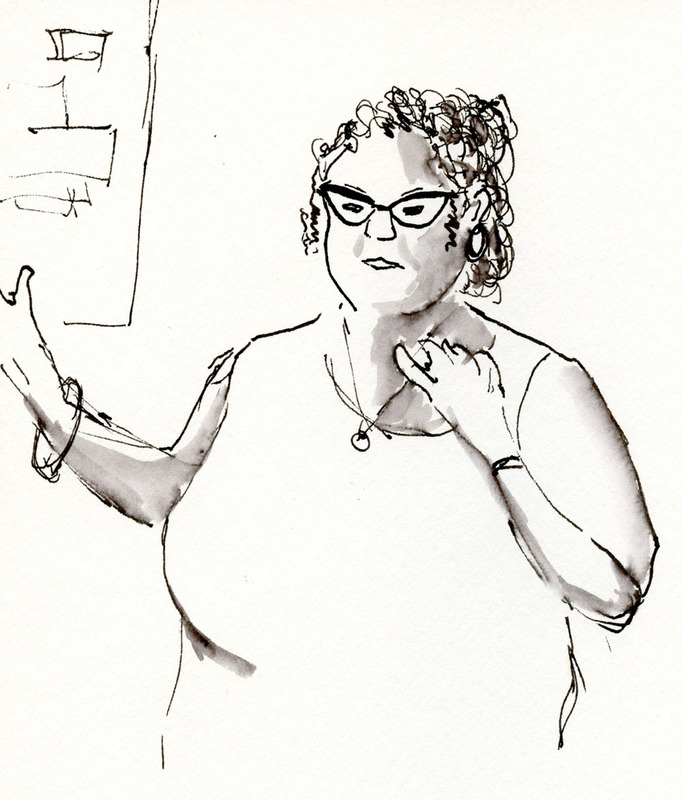 It was an inspiring weekend, and now I’m all warmed up for the Chicago symposium next week! Final throwdown at the MarketFront. 7/14/17 KK giving a presentation on his tools and methods. 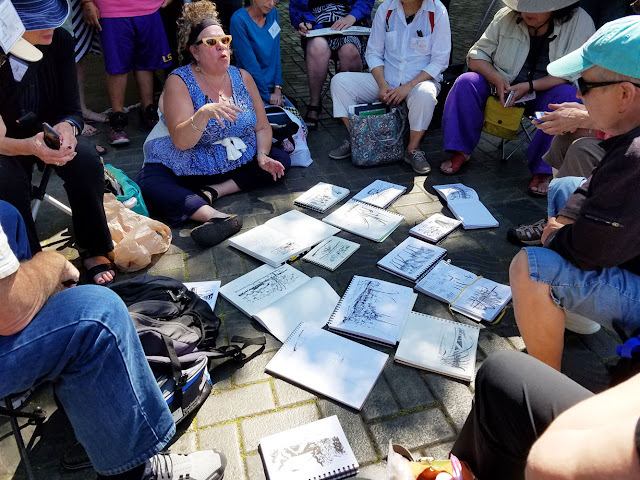 Seattle-area sketchers – and, as it turned out, many people who came from out of town, including as far as Costa Rica – had a fantastic opportunity this past weekend in the Dancing Lines workshop. 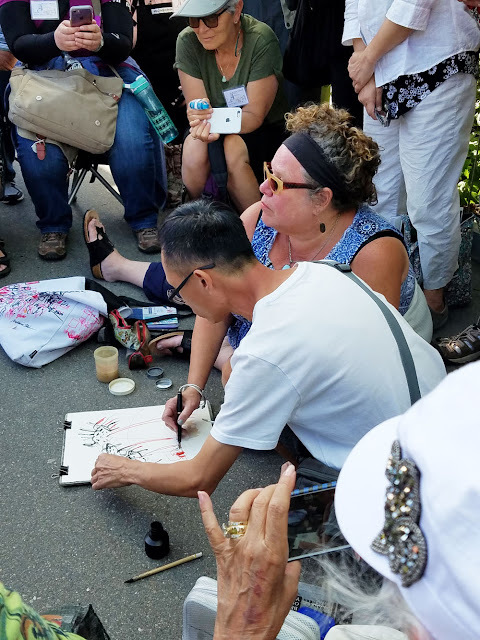 Sponsored by Urban Sketchers Seattle, the workshop brought in Penang, Malaysia, artist Ch'ng Kiah Kiean (better known as KK) and New York City artist Melanie Reim. I’m very grateful to USk Seattle for making this opportunity possible. It was like having a mini symposium in our own backyard! 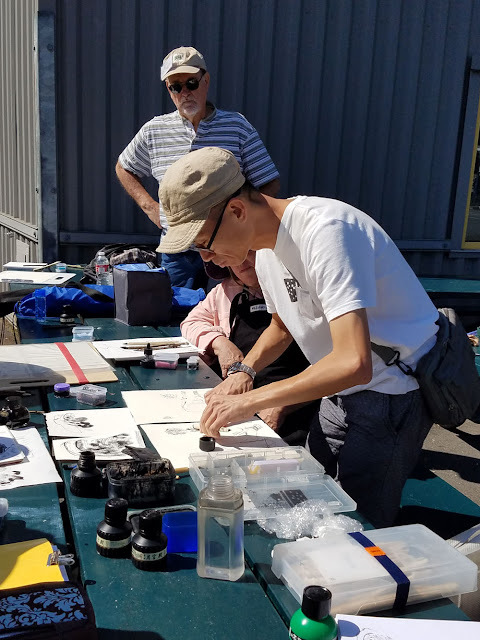 The two-day workshop kicked off Friday night with a meet-and-greet and presentations by the instructors at Daniel Smith’s Seattle store. To give all 30 workshop participants time with each instructor in each of two locations, the students were divided in half, and both groups met with both instructors each day. 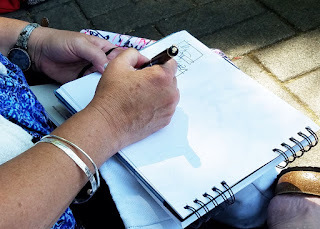 For better continuity in helping me document what I learned, my blog posts will cover each instructor’s curriculum instead of the chronology of the workshop days. Today’s post will focus on KK; the next will cover Melanie. 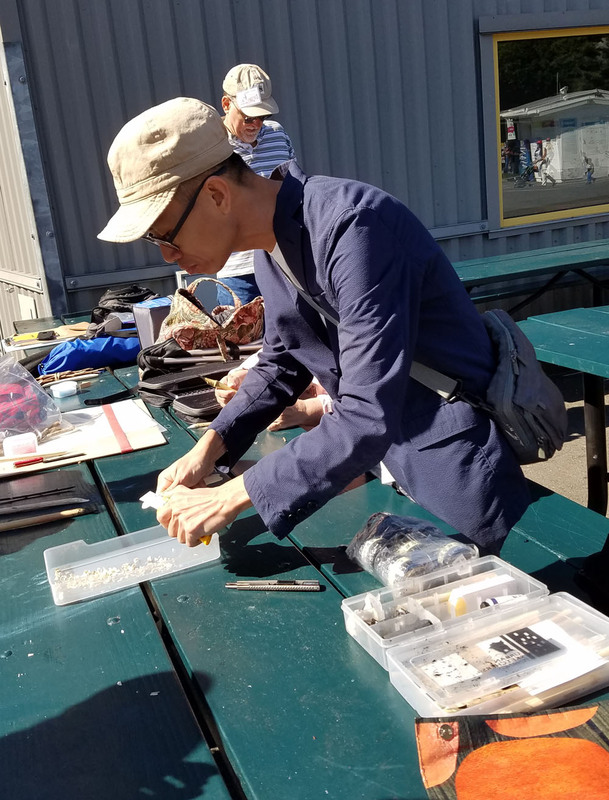 On Saturday morning at the Seattle Center, my group met with KK, who started off with an introduction to his simple tools. 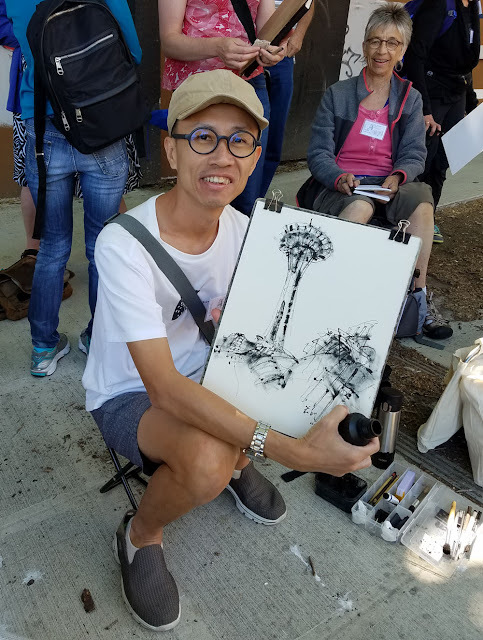 Well-known in the USk community for creating amazing paintings with nothing more than a twig and Chinese ink, KK generously provided each of us with a stick. These were no ordinary twigs from a jasmine tree; they were hand-prepped by his own father, who has helped prep hundreds of such twigs for KK’s workshops. He also gave us a small sponge in a plastic box for “dry ink” toning and a small jar with gauze to hold ink for his primary drawing method. Carving jasmine twigs into drawing instruments. Demonstrating various lines he is able to get with a single twig. Here's the way KK carves his twig "nibs." 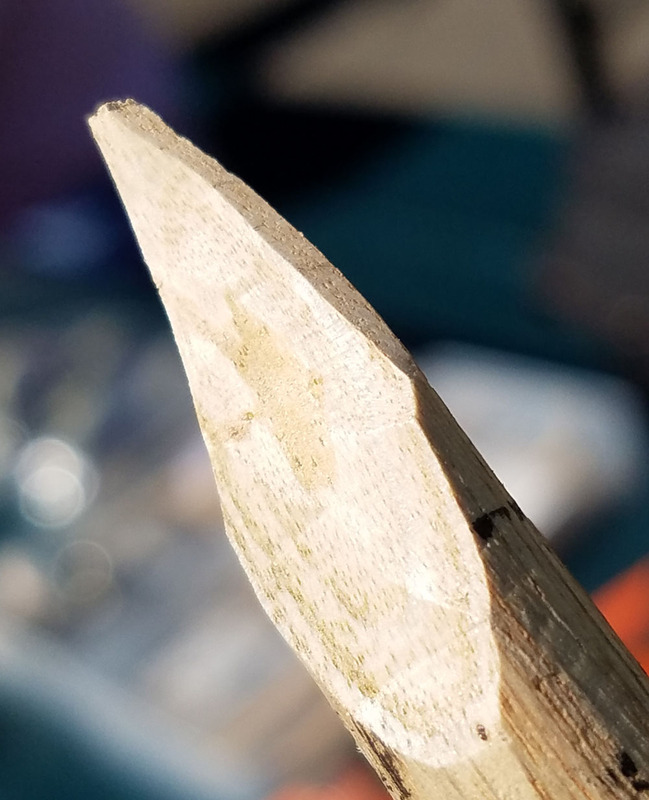 KK coached us in carving the ends of our sticks into a nib shape. 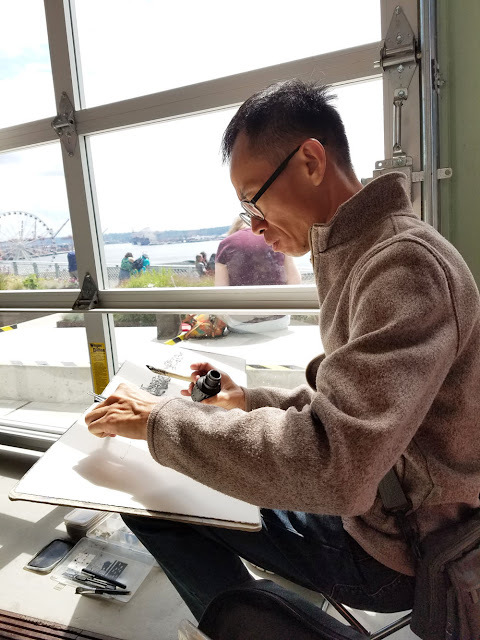 Surprisingly, he usually re-carves his own twigs before beginning each sketch to customize the size of the “nibs” for the subject matter and to freshen the points. 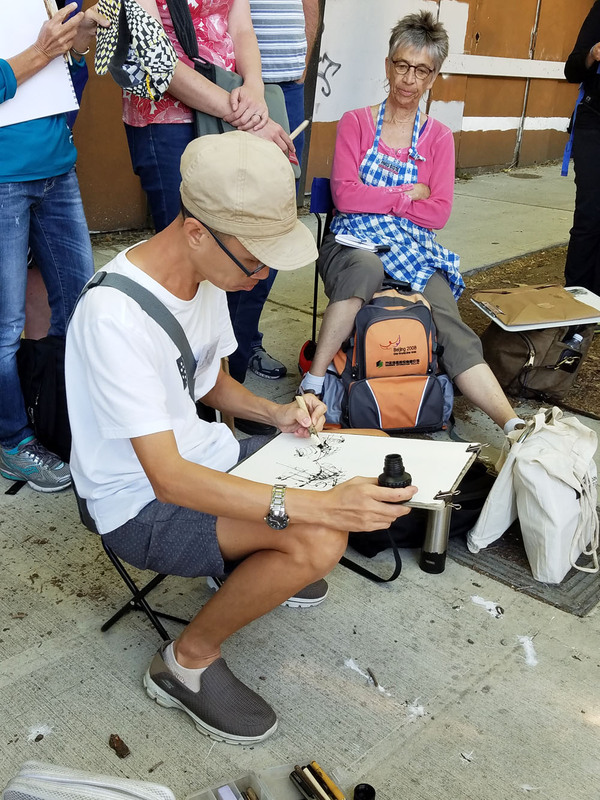 He also demonstrated how he uses inexpensive commercial stencil brushes to scumble tone on drawings. 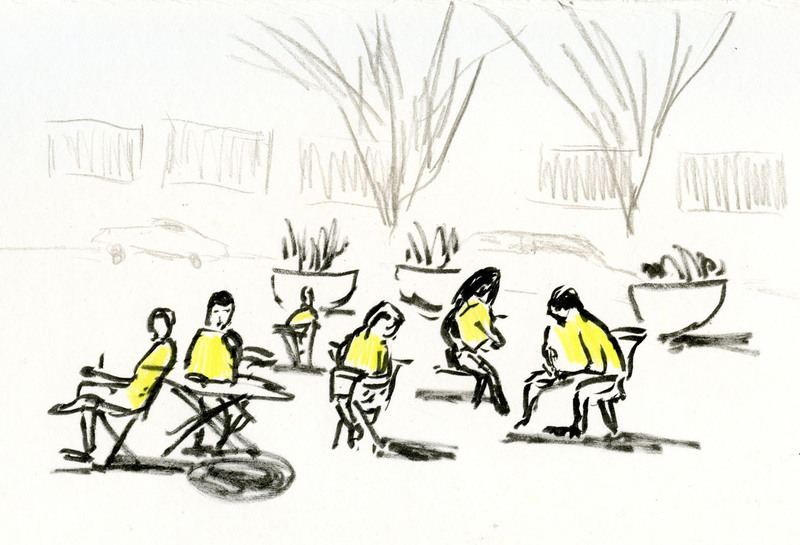 Seated at shady picnic tables behind the Museum of Popular Culture building, we practiced using our humble tools. He advised us not to hold the twig like a pencil but more like a piece of charcoal or upright like a brush. After that bit of practice, we walked around to the front of MoPOP in the shadow of the Space Needle. 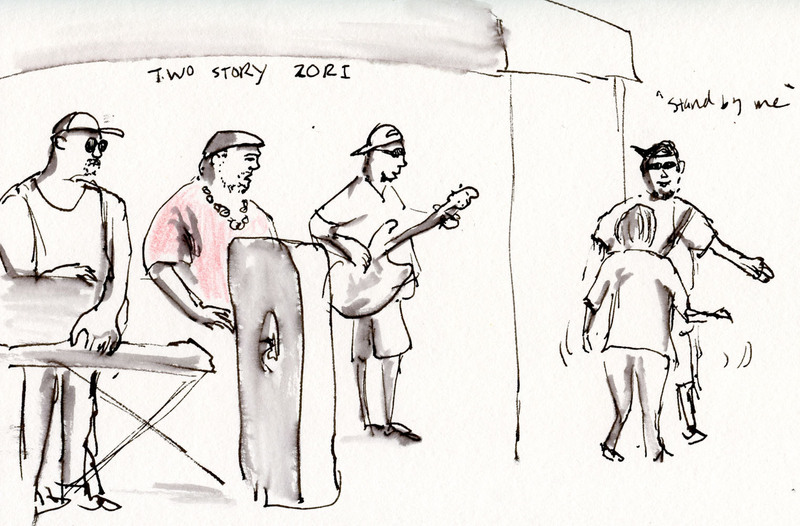 KK gave us a full demo by sketching those two Seattle icons, and then it was our turn. Demo at the Seattle Center. KK's finished sketch of the Space Needle and MoPOP. 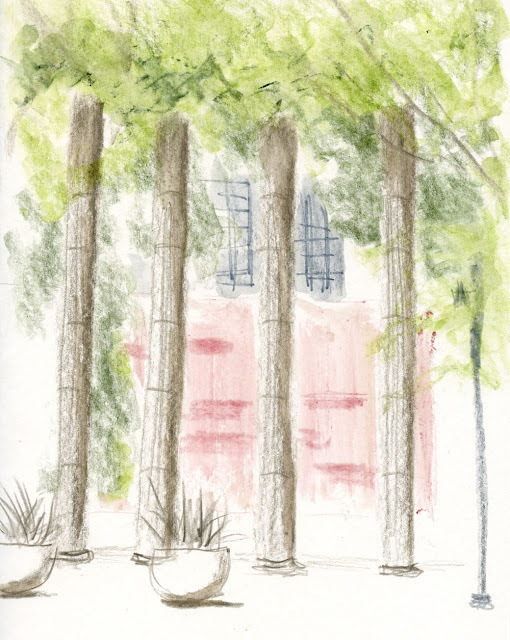 Although I wasn’t new to KK’s twiggy methods (I saw his demo at the Paraty symposium three years ago but haven’t practiced twig sketching in quite a while), scumbling with a stencil brush was new to me. I like the soft, charcoal-like tones I can get from it, and if the stencil brush is small enough, it can also be used to help form the shapes (as in the rounding of the crazy, organic MoPOP building façade). The second day my group spent the afternoon with KK at the Pike Place Market. 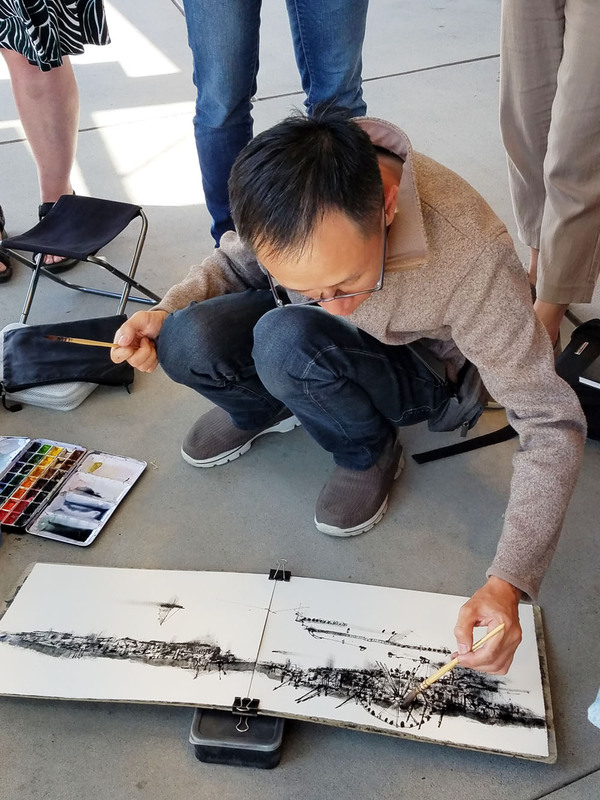 In a similar format to the first day, he began with a full demo of his drawing and painting methods. Sheltered in a quiet, windowed spot inside the new MarketFront (our temps in the high 60s were a bit chilly for this Malaysian! ), he made a magnificent panorama of the waterfront view. This time he added subtle color with watercolors. I tried to learn as much as I could from observing his process, but honestly, I simply enjoyed watching him the way I enjoy a magician’s performance: Even if I don’t know what’s going on, it’s sheer pleasure seeing how he wields his simple materials. Sketching the waterfront through the window at the Pike Place Market's MarketFront. KK adds touches of watercolor to his finished drawing. 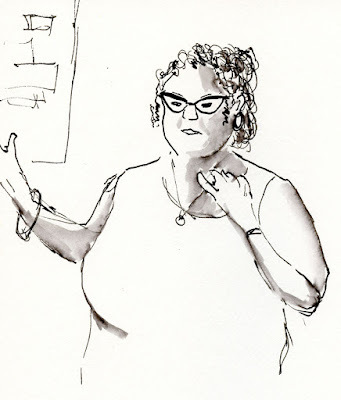 As a segue to my report of the sessions with Melanie Reim in the next blog post, I want to show you a couple of photos from the end of our first workshop day: A sketch made by KK and Melanie simultaneously! Right-handed Melanie and lefty KK sat side by side on the ground in front of the huge glass flowers marking Chihuly’s Garden and Glass museum. 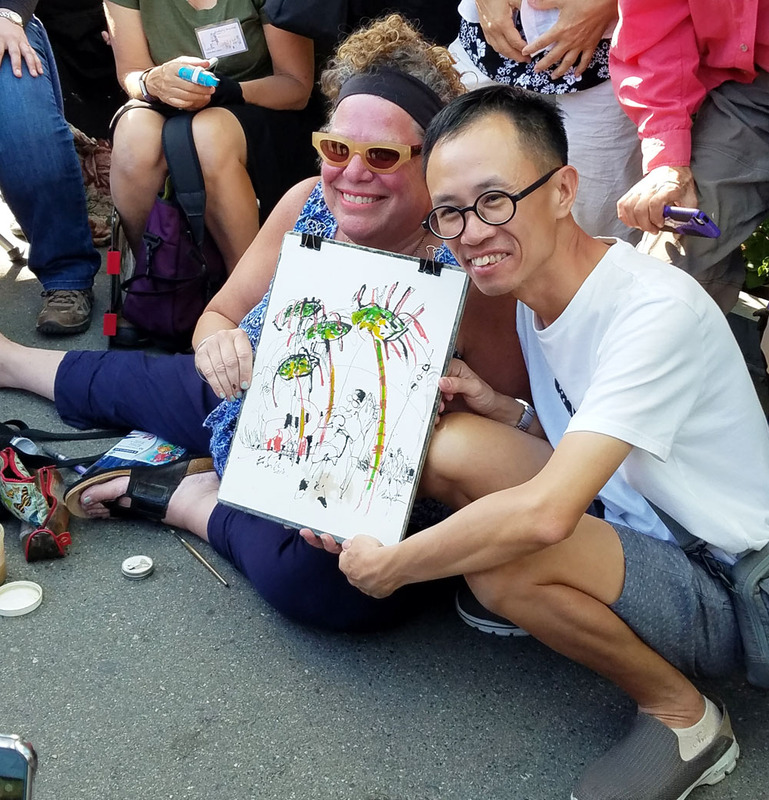 I applaud their courage for taking on this challenge that was as much performance art as urban sketching! 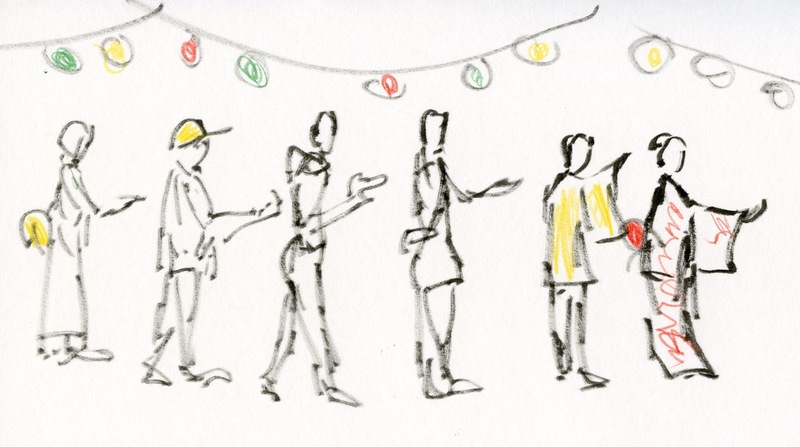 The fabulous collaborative sketch will be auctioned at the Chicago symposium next week, so if you like it, place your bid! KK and Melanie: dueling pens and sticks! This uniquely executed sketch will be auctioned at the Chicago symposium! 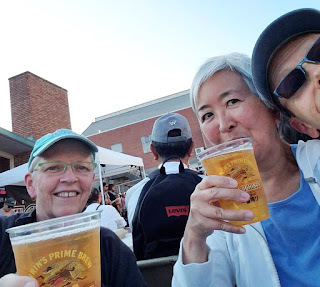 One of my favorite things to do on a warm summer evening is have dinner at a farmers market, and the best one for that is in the Queen Anne neighborhood. It has plenty of space for community seating, and a tent is set up for musicians and other buskers to entertain diners. Last Thursday Greg and I picked up fresh produce and then circled around to all the food vendors for our dinner. We both ended up at Mystery Bay Seafood, which makes the most delicious grilled salmon sandwich ever. 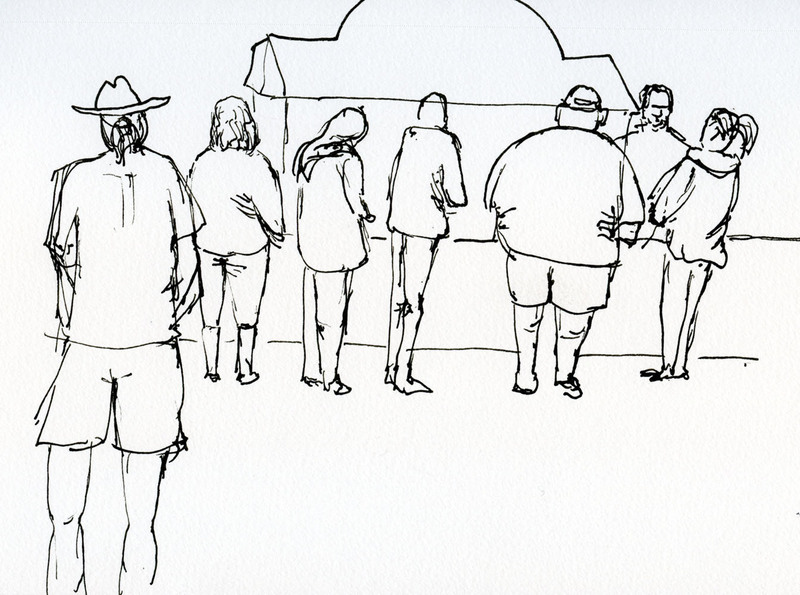 I knew this because I had the same sandwich a year ago when I sketched the vendor making it. 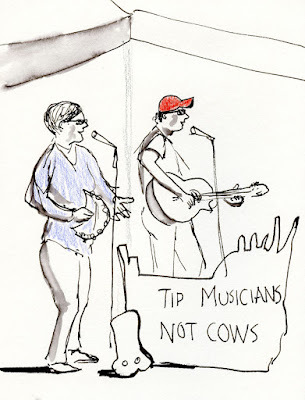 Then we settled in to dine, enjoying the folk music of the duo I sketched (and with the sign there to remind me, I certainly remembered to tip them afterwards). When I looked back at last year’s blog post, I was reminded that summer was just barely getting started in mid-July. This year we’ve already enjoyed a month of consecutive sunny, rainless days with temps mostly in the 70s. After last winter’s record rainfall, I feel I’ve earned the right to gloat! We haven’t had a summer like this in many years. With this sketch, I tried something a little different from my typical “coloring book” approach (drawing an outline and then coloring it in). It’s a bit more painterly (or at least that was my hope) and similar to how I’ve been doing still lives – using only colored pencils to both draw and color, and not relying on gray ink or markers for shading. In this case, it wasn’t more time consuming, yet it was somehow more challenging. I was trying to think in the same way that painters do when they hit the paper directly with paint without a drawing first. 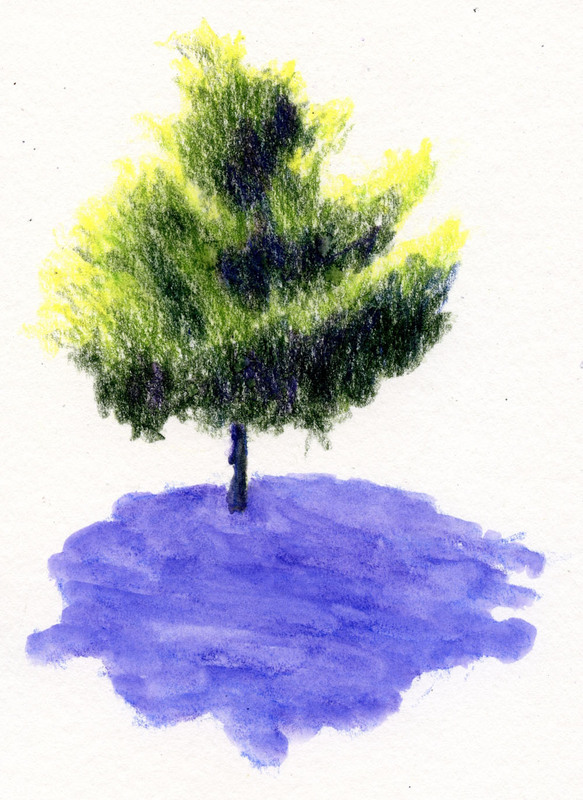 I know it’s easier with colored pencils, since they are essentially drawing tools, compared to using a brush with liquid, but old habits die hard. Overall, I like this approach, but my shading feels wimpy compared to using ink or markers. I’m going to work on intensifying values more. 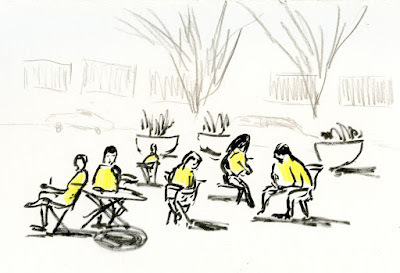 The other day when I visited the Northwest School to introduce a class to urban sketching, I arrived a few minutes early. The building, which is on the National Register of Historic Places, has an old lamp post topped by dragon-like gargoyles near the entryway. As I approached, I saw that building restoration was taking place, and an excavator next to the post caught my eye. Then I saw that workers were stabilizing and protecting the gargoyles so that the lamp could be removed. Within minutes, they had taken the post out of the ground, and by the time the kids arrived for class, the post and gargoyles were lying next to the building. 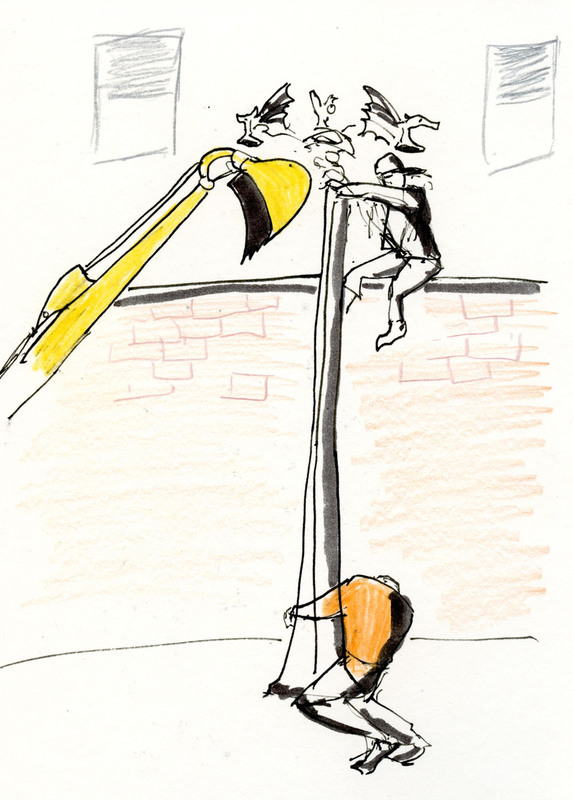 When I gave my presentation to the class, it was fun to show them the sketch that I’d made just minutes earlier because they had all seen the lamp post lying on the ground. I thought it was a good example of an urban sketch capturing a moment of action. 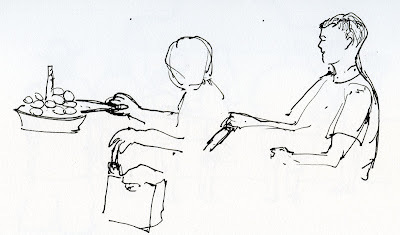 Sometimes I think about how much more sketching I might have done before age 52 (when I finally did start sketching) if someone had just handed me a sketchbook and a pencil when I was, say, 14, and put the idea in my head. Instead of being wrapped up inside my own angst-filled adolescence, maybe I would have looked around and observed more of the world. I would like to hope that something like that may have happened yesterday morning for at least some of the 13 students at the Northwest School who are learning about architecture and design. 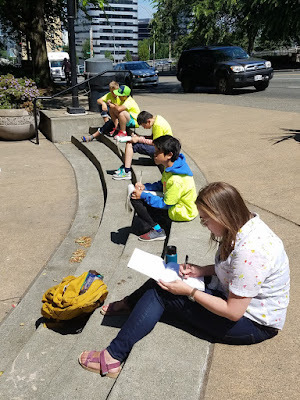 For the second year, the school and the Seattle Architecture Foundation invited Urban Sketchers Seattle to lead a class session in urban sketching. 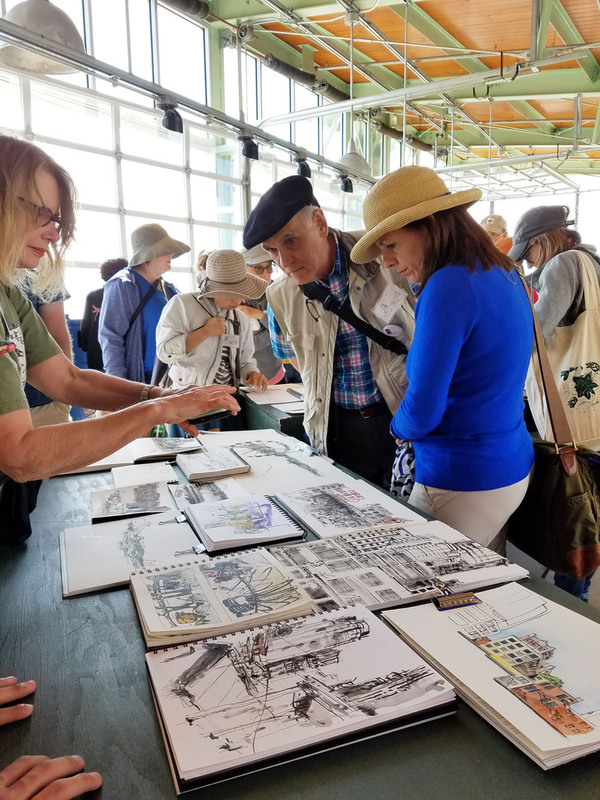 Michele Cooper and I talked about our personal approaches to urban sketching, and then we showed some sketches and our sketch kits. 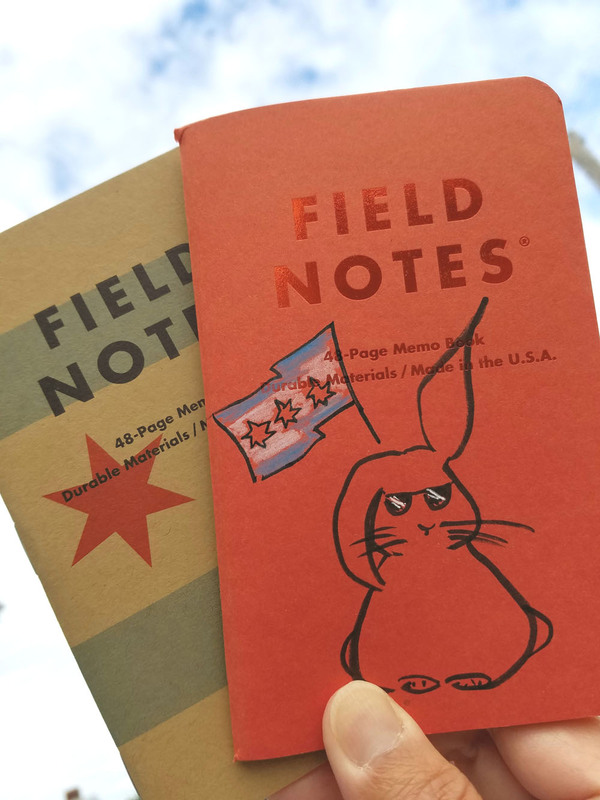 Then I handed out a stack of pocket-size notebooks and pencils, and the kids were ready for their field trip! Their teacher Matt Fujimoto and program coordinator Kathryn Higgins led us to nearby Plymouth Pillars Park. 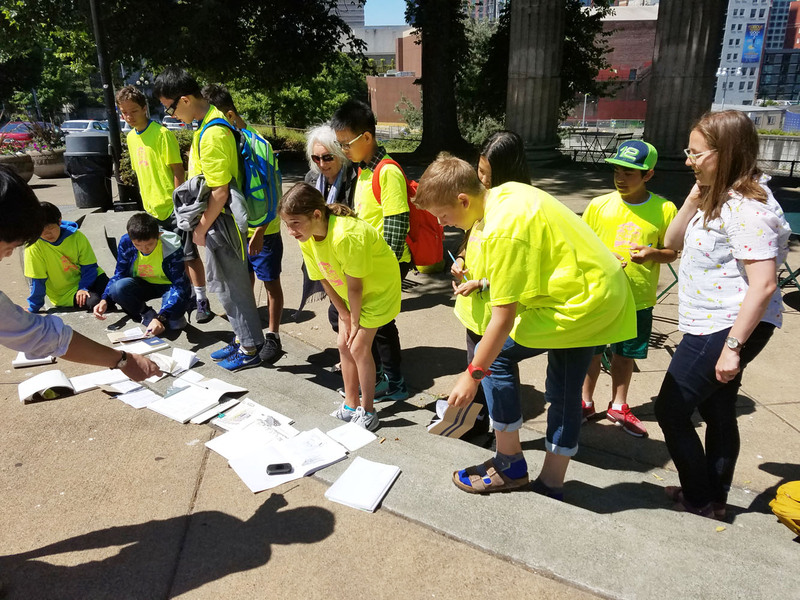 As was the case last year when David Chamness and I participated in the same program, the kids, ages 11 to 14, hardly needed our encouragement – they all leaped in with gusto. It was inspiring and heartening to see their energy and courage. 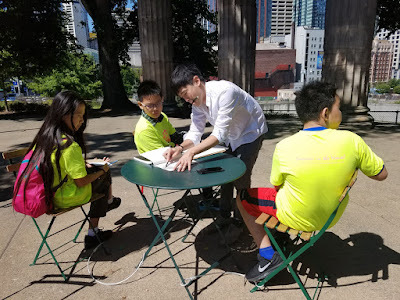 Teacher Matt Fujimoto helps the students get started. Michele is back there in the shade! Of course we ended with a sketchbook throwdown!